Violinist Dara Burkholder Morales joined the Philadelphia Orchestra in 2007 as Assistant Principal Second Violin. 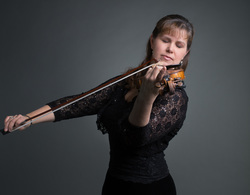 A native of Ephrata, Pennsylvania, she previously held positions as Principal Second Violin of the Utah Symphony and Opera, Principal Second Violin and Interim Associate Concertmaster of the Puerto Rico Symphony, and Concertmaster of the Northern Kentucky Symphony. Ms. Morales earned both her Bachelors and Masters degrees in music from the University of Cincinnati College-Conservatory of Music, where she acted as graduate teaching assistant and taught in the prestigious Starling Preparatory Program. As soloist, she has performed with the Utah Symphony, the Cincinnati Symphony Orchestra, the Puerto Rico Symphony, Allegro Chamber Orchestra(Lancaster, PA), the Bangor Symphony, and the Lancaster Symphony, among others.Her principal teachers include Kurt Sassmannshaus, Helen Kwalwasser, and Dorothy DeLay, and chamber music studies with Peter Oundjian, Henry Meyer, and the Tokyo Quartet. She lives with her husband Jesús, a cellist, and daughters Isabel,8, and Karina,5, in center city Philadelphia. Ms. Morales maintains an active private teaching studio.